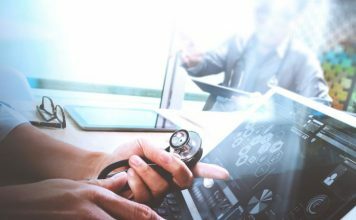 Despite the fact that Apple Watch — the first wearable device from Apple Inc — is a superb companion for your day-to-day techy life, with its quick access options and fitness trackers such as heartbeat sensor, it may often fail to offer a battery life that is one hundredth of a normal watch, as you have several smart features awaiting you! So, when it’s time to get an Apple Watch, you should be quite sure that it’s okay to charge your Apple Watch every day, at the end of the day. 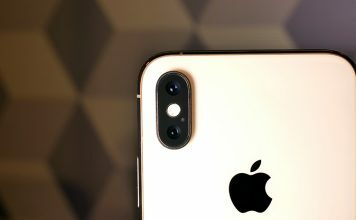 In that respect, buying an Apple Watch Dock makes enough sense we hope, because you’ll be able to put your watch in a safer place as it will be charged. Here, we’ve listed 10 best Apple Watch Docks, which will hopefully help you when you become a daily Apple Watch user. 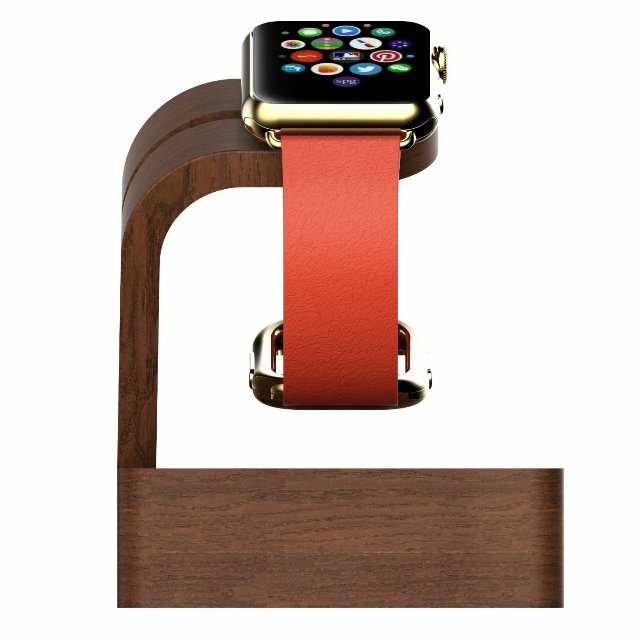 Navitech Apple Watch Charging Dock is a charging dock for Apple Watch that comes with a wood oak design that can offer a majestic look when you have placed your watch on it! Once you have placed the device on the corresponding place, it will become a small clock that you can check. 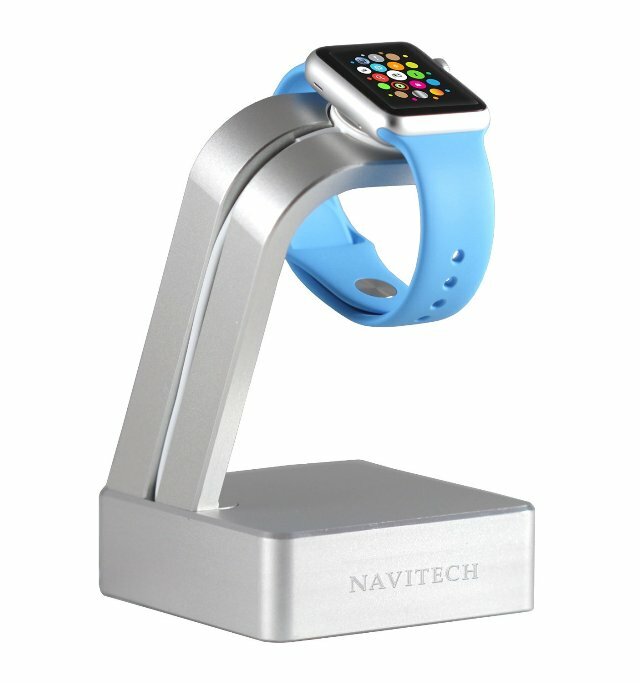 Navitech Apple Watch Charging Dock is compatible with all the Apple Watch models, including the 18 Karat Gold versions. In addition, Navitech Apple Watch Charging Dock offers a strong build too; it will be available for purchase from May 18. With a comfortable viewing angle of 45 Degree, Bluesim Apple Watch Docking Station seems to be a superb place for keeping safe and charging your Apple Watch at the end of the day, when it needs charging. The dock works well with both 38 and 42mm versions of Apple Watch and there’s a vast collection of colour variants to choose from too. 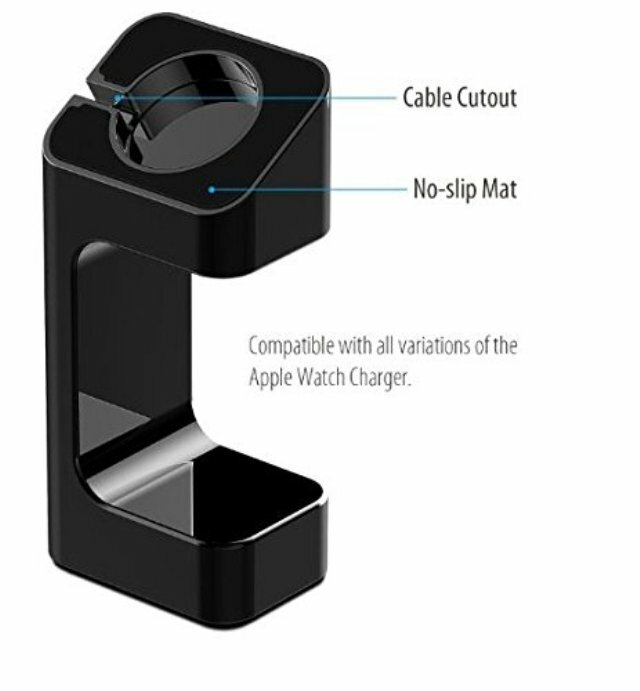 It has to be noted that Bluesim Apple Watch Docking Station has just-right cut-outs for connecting charging cable, though it does not come with a charging cable. 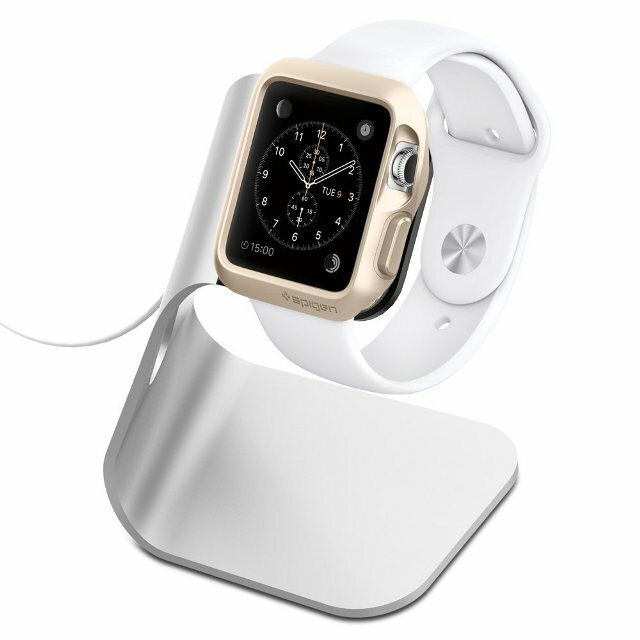 In addition, colour choice of the gadget makes Bluesim Apple Watch Docking Station a beautiful companion as well. 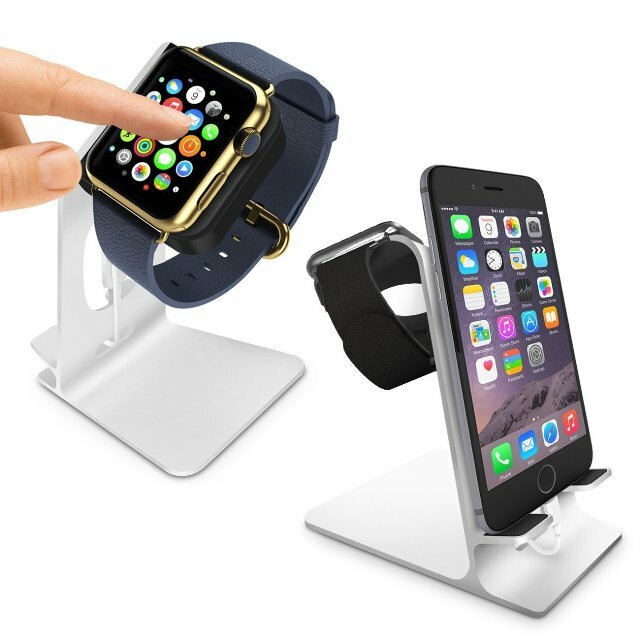 Spigen Apple Watch Stand is made of high-quality material that does not affect the build of your Apple Watch! 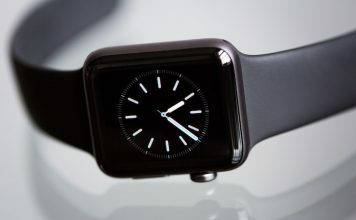 It also does not make scratches on the watch surface, and you can be quite confident as well. 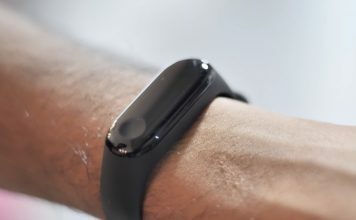 As the gadget headpiece has a viewing angle of 45 Degrees, it would be great to look at the watch when you have placed it on the dock to charge! Though charger isn’t included, Spigen Apple Watch Stand has perfect cut-outs to keep it well-arranged. Talking of its build, Spigen Apple Watch Stand is made of Aluminium, which is quite durable. Navitech Apple Watch Aluminium Charging Dock is actually a variant of Navitech Apple Watch Aluminium Dock that’s been mentioned earlier. So, if you need a stronger build of Aluminium rather than oak wood, you should go with the Navitech Apple Watch Aluminium Charging Dock, and there’s only a slight difference in terms of pricing. Just like the other version, Navitech Apple Watch Aluminium Charging Dock is compatible with all versions of Apple Watch and it will be a great platform to keep your Apple Watch while being charged. Combining professional looks and stabilized design, JETech Aluminium Apple Watch Dock is yet another safer way to keep your Apple Watch when it needs charge. As you place your Watch for charging, it will start working as a clock & it is indeed a great feature worth noting. Also, JETech Aluminium Apple Watch Dock has a great design that provides an impressive viewing angle, especially when you have to look onto the clock screen. In addition, there are different versions depending upon build and colour, giving you the freedom to choose. Yet to be released, Orzly DuoStand Charge Station is a product that aims those who need a combined way to charge both iPhone and Apple Watch. While the specifically-made section can be used to place Apple Watch, the side sector is meant for docking your Apple iPhone. 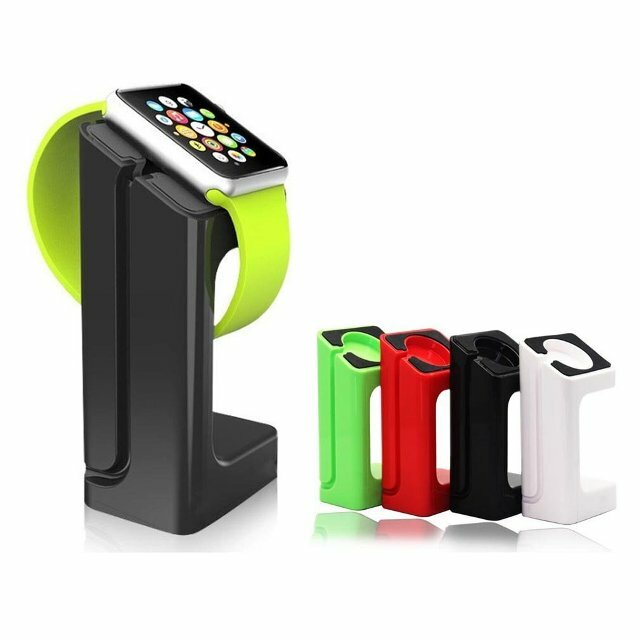 Talking of the support, Orzly DuoStand Charge Station support iPhone 5, 5C, 6, 6 Plus and all models of Apple Watch including 38mm and 42mm, which is a good reason to choose the product! It has to be noted that Orzly DuoStand Charge Station has sufficient cut-outs for connecting wireless charger and the Lightning charger as well. BDCC has made a truly impressive Apple Watch dock that is innovative enough to give you a superb viewing angle of 45 Degrees. It has a superb cut-out for keeping the charging cable safely and the non-slip mat is just awesome when it comes to the case of protecting Apple Watch from drops and all. 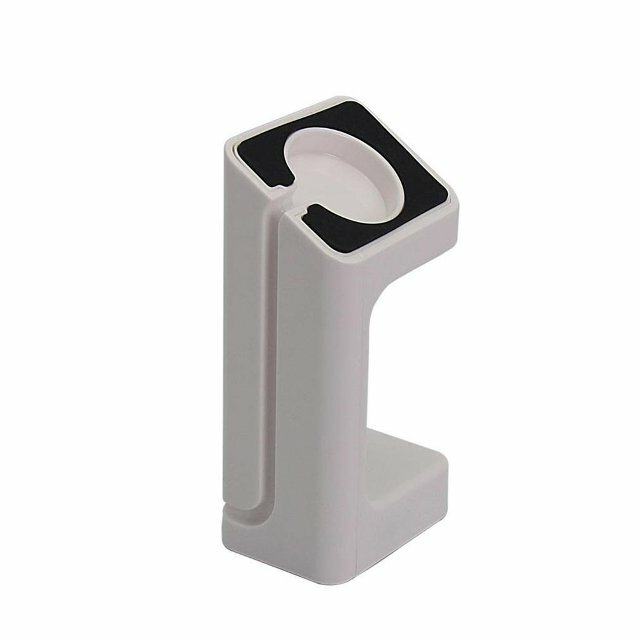 BDCC Apple Watch Dock Stand is compatible with both 38mm and 42mm versions of Apple Watch, given the professional quality. There are four colours to choose but the black one will probably give you a superb look. DLAND Apple Watch Charging Dock, though coming with a typical charging dock design, is impressive as a solution to keep and charge your Apple Watch charging dock. The dock is made of TPU that can protect your device and last for a longer period. Also, it has to be noted that DLAND Apple Watch Charging Dock comes with the 45 Degree viewing angle that makes the in-turn clock superb in effect. In addition, DLAND Apple Watch Charging Dock works well with both 38mm and 42mm versions of Apple Watch. 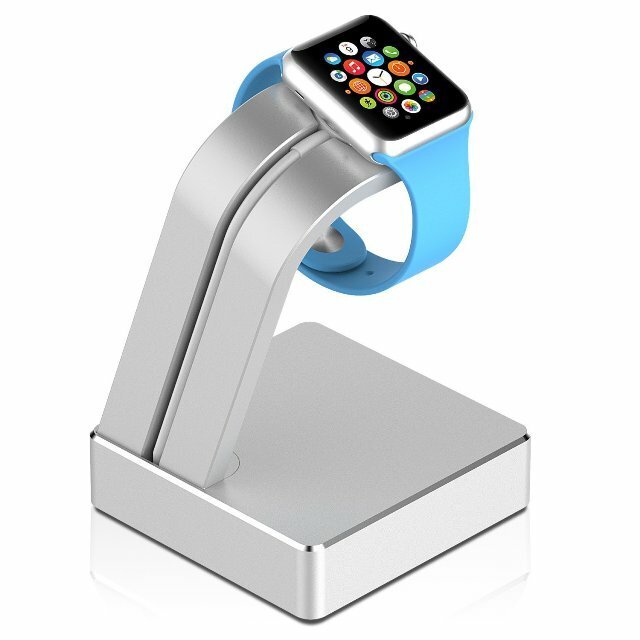 Monoy Apple Watch Dock Stand is a TPU-made light-weight charging dock for your Apple Watch, with viewing angle of 45 Degree that is optimal from the user’s point of view. Regardless the colour variant of your Apple Watch, it will be great to watch the combination with this black Apple Watch Dock Stand. Plus, charger slots are compatible with all Apple charger cables, creating less mess as you can keep your chargers well-organized. As a whole, you’ll be able to connect the charger with the dock and sit back and relax. So, it’s a good choice we think. iMarku Apple Watch Charging Stand is made of plastic but the material is efficient enough to offer an impressive sort of protection and the specially-made cut-outs for charging cables and all make iMarku Apple Watch Charging Stand a superb gadget when we consider the convenience of connecting device with it and letting it charge. 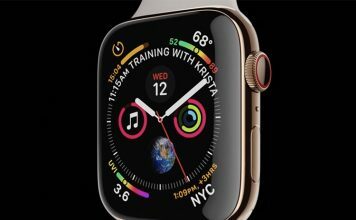 And, as we have said, when you have put the Apple Watch for charging, you can use the watch as a clock — well, with comparatively smaller display when the truth is told. 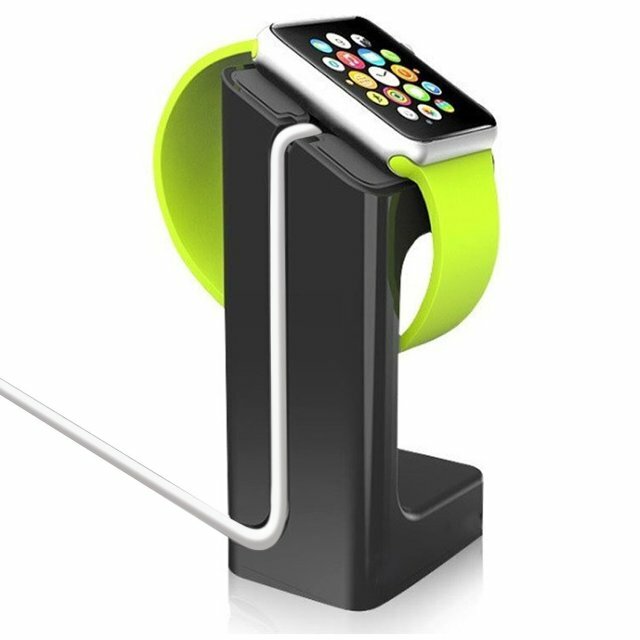 Altogether, iMarku Apple Watch Charging Stand is a great choice that you can have at a mediocre level budget. What do you think about this list of 10 best Apple Watch Docks? We are eager to know, so is the comment section!